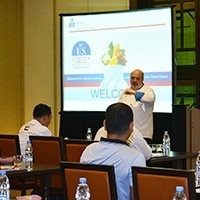 Culinary cheese experts from the United States discussed how to capitalize on cheese trends to build restaurants' bottom lines. Demonstrations showed foodservice techniques for a broad spectrum of cheeses, from soft and fresh to hard and aged. Practical presentations also explored the makeup of a classic cheeseboard, with lessons on choosing, portioning and artfully displaying cheeses. Finally, at an evening gala reception, participants experienced firsthand the culinary magic of cheese and beverage pairings.